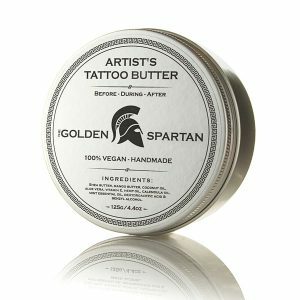 The Golden Spartan Aftercare Tattoo Butter is a premium, luxurious, 100% natural, vegan tattoo care product used after tattooing. The combination of our highest quality all natural ingredients accelerate the healing time, reduce inflammation, and even help reduce the risk of infection. Applying a thin layer to new tattoos will help to protect, nourish and moisturize the skin. It will soothe and relieve itching without clogging pores or leaching color. Our Aftercare Tattoo Butter can be used with older tattoos, to improve the clarity, and to restore and rejuvenate the colors. It can also be used as a healing ointment for other cuts, scrapes and scratches. To avoid contamination, please wash hands thoroughly before each use. It does not contain petroleum, paraben, silicone or mineral oil. 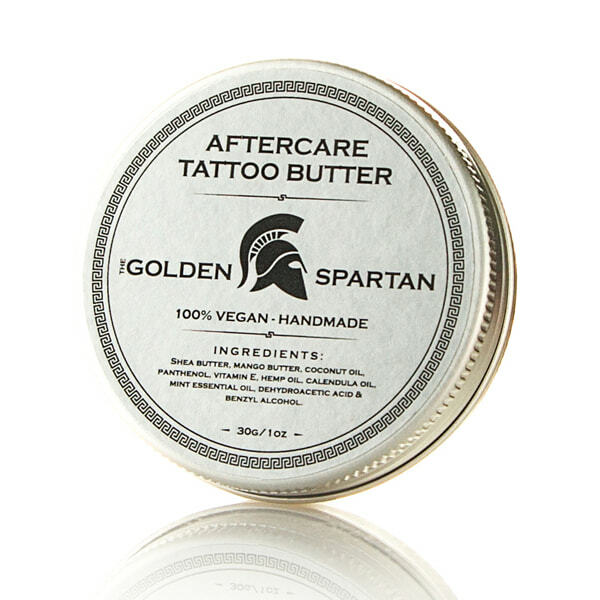 “After tryin’ The Golden Spartan Aftercare tattoo butter I put away all of my other aftercare products. It has a great effect on the skin, helping it to heal much faster. The most important thing is that it’s 101% natural, which is crucial for sensitive skin after hours of tattooing”. “This is the product that the tattoo community has been waiting for a long time! Natural, soft on the skin and helps the healing process. No matter the size of the tattoo, this product is crucial for the overall aftercare and final look. Most importantly, all our customers are 100% satisfied”. Ingredients: Shea butter, mango butter, coconut oil, panthenol, vitamin E, hemp oil, calendula oil, mint essential oil, dehydroacetic acid & benzyl alcohol.